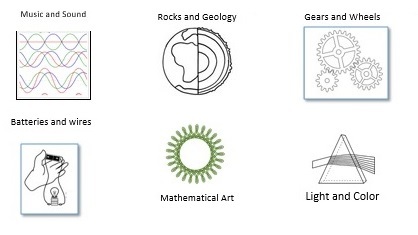 Science Wednesdays is a weekly science-technology-math group for children ages 8 and over. We meet each Wed. (except holiday weeks) at 4pm in the conference room at 964 Parker St. at the Mildred Hailey (Bromley Heath) Apartments, near Jackson Square on the MBTA orange line. It is a component of the RealKidz afterschool program and a companion program to the Southwest Corridor Park's children's gardening program. Meetings include an after-school snack and opening discussion about a science topic, followed by time for hands-on activities. Discussions and activities are sometimes inspired by current events and science news such as a Nobel-prize award, a solar eclipse, a local environmental issue; other times inspired by participant interests and interesting science kits and materials: electronics, chemistry kits and physics experiments with light, sound and motion for example. Email Jennifer Leonard at jleonard@skillslibrary.com for more information.